Exclusive industrial districts, Area planning is available. Building coverage ratio 60%,　Floor area ratio: 200%. To drain to the exclusive drain pipe, after processing by each company individually. Special high voltage（66kV）is available to be led in. 5.0 km, 10 minutes by car, from Tobu-Kanasaki station on Tobu Nikko Line. 8.5 km, 17 minutes by car, from Omocha-no-machi station on Tobu-Utsunomiya Line. 7.5 km, 15 minutes, from Mibu interchange on Kitakanto Expressway. 8 km, 16 minutes, from the Kanuma interchange on the Tohoku Expressway. 3km, 6 minutes, from National Route 352. 3km, 6 minutes, from National Route 121. Name of Municipality ： Mibu Town. Fixed assets investment: 150 million yen or more. Number of regular employees: 10 or more. To be operational, for factory etc., within 3 years from the land acquisition. Incentives for fixed assets investment amount. 1/3 of the equivalent amount of the fixed assets tax （no limit amount）. 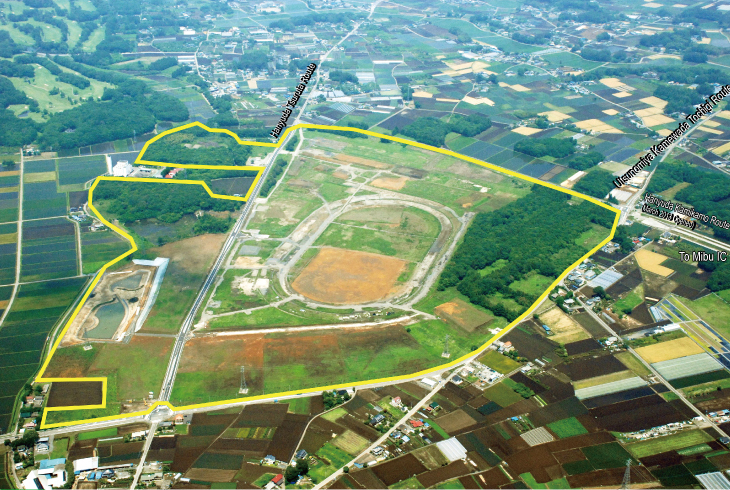 To acquire land area of 3,000 m2 or more at Mibu Hanyuda Industrial Park from Tochigi Prefecture. To continue its business for 10 years after the commencement of its operation. To grant for 10% of the land acquisition amount. To grant for 5% of the land acquisition amount. Designated operators for the incentives for fixed assets investment or land acquisition. To hire 5 or more new employees of town residents for 1 year or more from the commencement of its operation. Full-time employees: 200,000 yen per person. Other than full-time employees: 100,000 yen per person.